Joshua the Camel Comes to Visit Birches! Joshua the Camel and his alpaca sidekick Flash walked onto the Birches playground at mid-morning today with their human friend Tom. The students had not known a camel was coming to visit although they had been studying camels in connection with their Silk Road studies. No one could believe that an actual camel was ambling toward the school. And not just ANY camel! Joshua is the gentlest, most laid-back creature you could hope to meet. He was happy for the children to pet his incredibly soft fur as long as they wanted. He would have been a great camel for a long, hard caravan journey across the Western Silk Road. We say "Western" because he is an Arabian or Dromedary camel, the kind found in Western Asia and North Africa. (The two-humped Bactrian camel is found in East and Central Asia.) One student declared he didn't want to wash his hands because he wanted to preserve the soft feeling of Joshua's fur! Joshua isn't picky about his food and he was happy to eat the fallen autumn leaves the children offered him. He is nine years old and will probably live until he is about fifty. He is a pet for life! Lucky Tom! 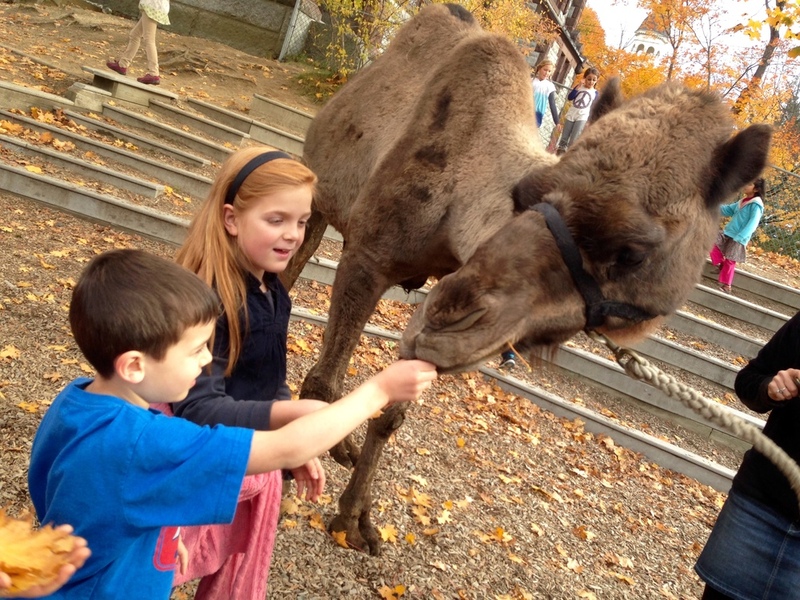 Several students are now considering asking their parents for a pet camel. Did you know that Joshua's ancestors (belonging to the camelid family which also includes llamas and alpacas) originated in North America some 40-45 million years ago? About a million to two million years ago, they started to migrate: some traveled north and west across the frozen Bering Strait to Asia and eventually North Africa; some traveled south to South America. We are glad that Joshua found his way back to North America and to nearby Berlin, Massachusetts! Newer PostMathematics on the Silk Road!